Is there anything bacon can't make better? One of the adults at our school asked if we were using turkey bacon to make bacon cheese bread in our food appreciation classes. We teach kids to make traditional foods using traditional tools and techniques. Modern “healthy” alternatives, such as substituting a processed turkey product for real pork bacon, is an entirely different lesson But you could certainly opt for the ersatz bacon when making this bread at home. And believe me, you will want to make this bread. We love to torture the rest of the school with our cooking aromas. The smell of bacon sizzling on the stove top–followed by sauteed onions–started mouths watering all over campus. Add to the bread heaps of Parmesan and Gruyere cheese and you practically have a stand-alone meal that any southern chef would be proud to put on the menu. In fact, this bread would be even more perfect slathered with pimento cheese, another southern specialty. And it’s not at all difficult–or time consuming–to make. 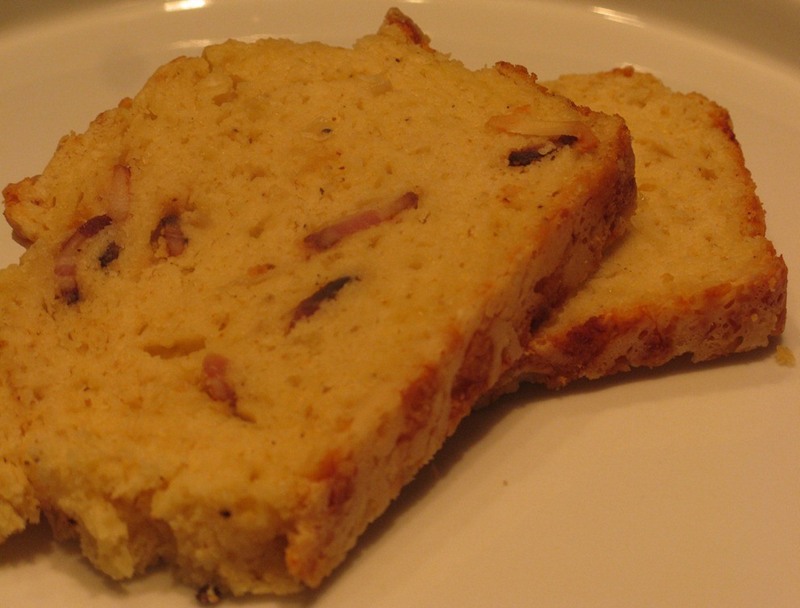 This is a quick bread, after all, where baking powder is the principle rising agent. Start by grating 3 ounces Parmesan cheese over the large holes of a box grater. Set aside. Then grate 4 ounces Gruyere cheese and reserve separately. Next, cut five slices of thick bacon into 1/4-inch pieces. Sautee these until almost crispy in a heavy skillet over moderately high heat, then drain the bacon onto paper towels, reserving 3 tablespoons of bacon grease in the pan. Next, sautee 1/2 medium onion, chopped fine, until lightly browned. Set aside. For the wet ingredients used in this bread beat 1 large egg in a medium mixing bowl, then whisk in 1 1/4 cups milk, 3/4 cup sour cream and 3 tablespoons melted butter. For the dry ingredients, whisk together in a large mixing bowl 3 cups all-purpose flour, 1 tablespoon baking powder, 1 teaspoon salt, 1/8 teaspoon ground black pepper and 1 pinch cayenne pepper. Using a spatula, mix in the 4 ounces grated Grueyer cheese, tossing and stirring until the cheese is completely coated with the flour mix, breaking up any clumps of cheese as you go. Grease a 9-inch by 5-inch loaf pan with cooking spray. We had some issues with the bread sticking to our pan, especially on the bottom. You might want to line the bottom of the pan with a piece of parchment paper and spray it well. Dust the bottom of the pan with 1/2 the reserved grated Parmesan cheese. Pour the wet ingredients into the flour mix and mix well with a rubber spatula, scraping the sides and bottom of the bowl until all of the ingredients are incorporated. Scrape the batter into the prepared load pan, smooth out the top and dust it with the remaining grated Parmesan cheese. Place in a 350-degree oven for 50 minutes, or until the loaf is golden brown and a toothpick inserted into the middle comes out clean. Allow the loaf to cool in the pan for about 15 minutes, then invert and place the loaf on a wire rack to cool further. Make sure to get a slice for yourself. This bread does not last long! Ed, what do you do about students who don’t eat bacon for religious reasons? Great question. We had at least one Jewish student in the class who keeps kosher. He helped make the bacon cheese bread, but he did not eat it. As I sometimes remind the students, if you’re going to be a chef, you need to be able to make all sorts of things that you might not eat yourself. Likewise, we have a couple of kids who are allergic to nuts. They help with the cooking up to the point where the nuts come into play, then they step away from the prep table. And of course they do not eat foods we eat with nuts in it. We try not to make lots of dishes with nuts, and we always ask (or the kids will always ask) whether any of the things we are making pose a problem with any allergies. We do not use peanut products at all.